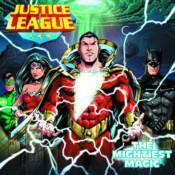 The Justice League takes on supervillain Black Adam in this brand-new 8x8 storybook! When magical relics disappear from around the world, the Justice League flies to a distant country to retrieve the priceless items. But when Batman, Wonder Woman, and Green Lantern discover who is behind the plot, they have to bring in the World's Mightiest Mortal to defeat such a powerful super-villain.